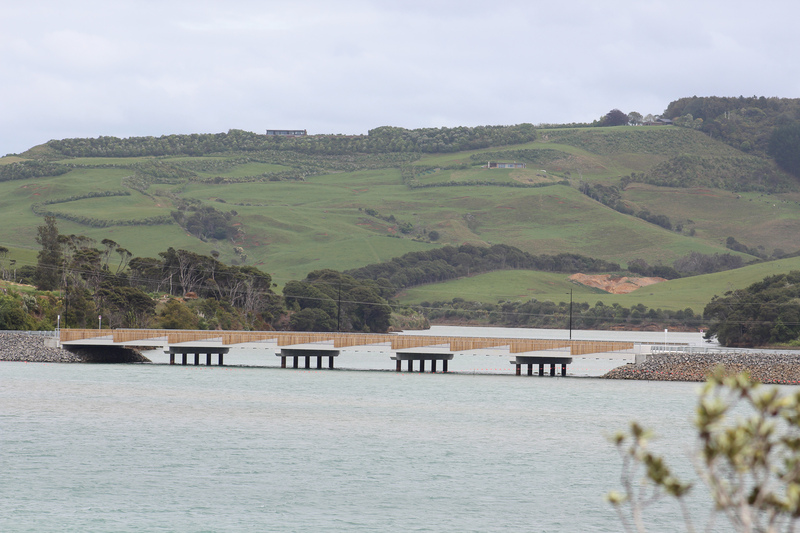 The bridge that leads to the Rangitahi project is due to open early next year with a karakia by local iwi. Awaiting asphalt surface and the installation of pou designed by Kawharu Greensill, Rangitahi Marketing and Communications manager Sophie Peacocke says the bridge opening is a huge milestone for the project. The pou represent turuturu – the pegs used to string the cloak across during the weaving process – and the zig zag pattern on the bridge represents the cloak and signifies the two pieces of land coming together. Sophie says the bridge was completed pretty much to schedule with only a one-month delay while council and project contractors Fulton Hogan nutted out some of the finer details. The bridge is two-lanes with pedestrian and cycle access. The footpaths are 2.5m wide and act as shared spaces to link to the walking tracks around the peninsula. “We wanted to encourage people to get out walking or cycling rather than using their cars, especially on the weekend they can walk or cycle into town,” she says. Work started on November 6 to upgrade Opotoru Rd and connect it to the bridge and this will continue through summer and is expected be completed in six-months. The intersection of Opotoru and Wainui Rd will also undergo a transformation with a median strip for turning, the addition of a ‘pedestrian refuge’ for crossing safely, and the diagonal parking outside Raglan Roast Food Department will be reduced to two parallel parks and three parallel parks added to Tahuna Ave.
As part of the consent conditions all subdivision construction vehicles must use Te Hutewai and Bensemen Rds for access, this does not include homebuilders, who will have access to the bridge. Stage one, comprising 88 sections, is sold and stage two – opposite the golf course -made up of 28 lots started selling in March with 12 lots already sold. Concerns surrounding the increased demands on the Wainui Rd one-lane bridge due to the Rangitahi development as well as increasing visitor numbers is being addressed by Waikato District Council in the Long Term Plan 2018-28 with a view to replace with a two-lane bridge. At this stage, an estimated replacement of this nature would cost in the region of $15 million. A decision on the bridge is due in 2021 with the design/construction scheduled to take place 2023-26.